The box style legs are easy to bolt on and level, so you can be sure the table is set properly. The MDF bed playing field allows lighter weight of the table, which in turn makes it easier to move around the room than in the case of a traditional, full size slate bed pool table. The MDF cabinet features a high quality laminated matte black finish and can easily be kept clean with a damp cloth. The hard wearing blue playing cloth is a stylish complementation of the table’s design. 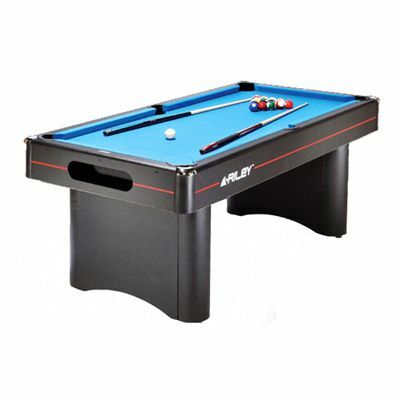 for submitting product review about BCE 6ft Riley Pool Table (Black).